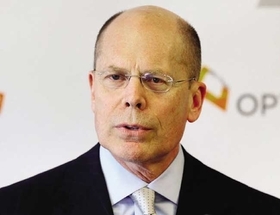 UnitedHealth CEO Stephen Hemsley is stepping down from the helm of the nation's largest health insurer. David Wichmann, the Minnetonka, Minn.-based insurer's president, will take over as CEO and become a director of the company on Sept. 1. Hemsley, who has been with the health plan since 1997, will remain with the insurer in a newly created role as executive chairman of the board of directors. In a statement early Wednesday, UnitedHealth noted that the change has been in the works for the last four years and is "designed to ensure continuity as the company continues to grow and evolve." "This is the right time for this transition to take place, as the company is performing strongly and has a positive outlook for the foreseeable future, and Dave Wichmann is the right choice to succeed as CEO for that future," Hemsley, 65, said in the statement. Hemsley became CEO in 2006 and grew the company into the largest publicly traded health plan with annual revenue of $184.8 billion and 49.5 million members. Wichmann, 54, has been with the company since 1998. He was chief financial officer from 2011 to mid-2016 when he became president of the company.